There are several types of forklifts on the market; however, the most popular forklift rentals are made to assist workers in industrial settings, or on construction sites. A forklift rental can also help in a pinch when a machine goes down in a warehouse. Since forklifts can move products and materials with superior efficiency, even in tight spaces, they are the machine of choice when unloading, moving, or lifting products. Equipment Rental Direct can help you find the best forklift rental for your business and your budget. Forklifts are produced specifically for use in settings where they will increase overall productivity. 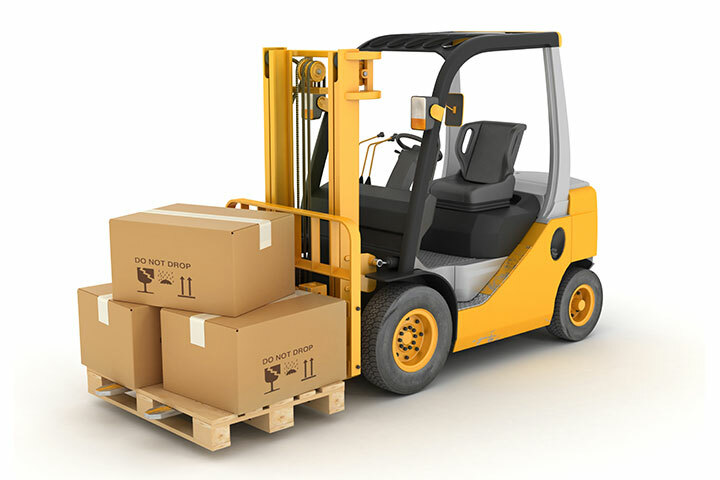 Some forklifts are made primarily to move palletized materials across rough terrain, while others are specifically set up to move heavy furniture to the highest areas in warehouses. Forklifts can even be equipped with accessories that allow workers to complete interior maintenance tasks with ease. Lumberyards - Forklifts are used in lumberyards to lift, move, and load pallets or raw lumber. Factories - Factory workers use forklifts for loading and stocking, as well as transferring pallets from one side of the plant to another. Construction zones - On construction sites, forklifts lift heavy materials from trailers, lift lumber or roofing materials to scaffolding, and even deliver pallets of drywall through rough openings in above-grade framing. Warehouses - Forklifts are used in warehouses to stock shelves, load and unload shipments from trucks, and rotate palletized inventory. Retail sites - Forklifts are commonly used in retail settings to stock shelves and pick orders. Landscaping - In landscaping, forklifts can be used to haul sod, move boulders, and unload bagged mulch or stone. Forklifts intended for the job site are built to withstand traveling over uneven ground while carrying large amounts of weight. There are three main types of construction forklifts on the market: trailer mounted, variable reach, and vertical mast. Trailer Mounted Trailer mounted forklifts (sometimes called a piggy back) are mounted to a trailer or truck and are mainly used for unloading materials. Variable Reach Variable reach forklifts come standard with telescoping booms, which are just right for lifting materials to high points on a job site. Vertical Mast Vertical mast forklifts have an ordinary up and down lift system. These powerful machines can easily move heavy bagged, palletized, or raw material. The forklifts used for industrial applications are often multi-purpose machines. Many of the forklifts can move, load, unload, and lift materials or people; however, most forklifts have at least one specific and intended purpose which is distinct from similar machines. Electric Electric forklifts are optimal for indoor use; such as in retail settings, due to the lower emissions of the machine. Counterbalance Frequently used for heavy loads, the forklift's counterbalance system prevents tipping. Order Picker Order pickers are designed to easily extract orders from shelving and are most often used for retail or warehouse applications. Reach Truck When picking or loading at great heights, the reach truck is the most favorable of the forklifts. Narrow Aisle As the name implies, this type of forklift is built to navigate in narrow spaces with ease. Pallet Stacker A pallet stacker allows the worker to stack pallets. A stacker can also move pallets across the floor, but if speed is desired for horizontal movement, the pallet truck is preferable. Pallet Truck Pallet trucks move materials quickly from one area to another, but they are not capable of stacking. Any person who operates a forklift is required by OSHA to undergo training and obtain certification. Forklifts are extremely useful in the workplace and can help a business operate more smoothly and efficiently when utilized by a trained operator. Forklift training helps an operator become more comfortable using the forklift controls and also teaches safety procedures. Forklift operation can become almost second nature to an operator who has been using a machine for some time. It's a good idea for operators to occasionally review the manual given during certification. Walk the perimeter of the forklift, checking for safety concerns. Use any safety equipment available to you. Observe your surroundings before touching any controls. Keep your speed at the lowest possible rate to properly complete the work. Turn only on flat surfaces to avoid tipping. Lift only the allowable weight as stated on the spec sheet. Be sure to lower forks and remove the key when exiting the machine. Renting a forklift is an affordable way to gain access to a machine that can vastly improve your workday. Forklifts can lift and move heavy materials in a fraction of the time it would take several powerful people to do the same job. Forklift Rental Rates - Daily forklift rental prices start around $100; a small cost for an incredible increase in production. Forklifts are rented by the day, week, and month. Rates are often discounted for weekly or monthly rentals. Finding the Right Forklift - Choose the forklift that can help you accomplish the most tasks for your project. Consider renting two forklifts if you have targeted tasks that one machine alone cannot complete. The money you would spend on manpower to do the same job could far exceed the daily rental rate. Reserve Now or Rent Later - Whether you need a forklift immediately, or a month down the road, Equipment Rental Direct can help you reserve an affordable machine for your project. Just let us know how soon you need your rental and we can assist you in getting the machine you need at a great rate. Improve productivity by using the right forklift for the job. Forklifts can easily heft thousands of pounds at once, saving you valuable time on menial labor and allowing your workers to concentrate more important tasks. Equipment Rental Direct can help you find the right forklift for your application whether you need a rugged machine for a construction project or a small pallet truck to help with a big order.